If you're thinking of a Colorado hiatus this summer, check out Pagosa Springs. Wildfires had scorched Colorado in the summer of 2013, burning even more than the 70,000 acres destroyed in 2001. Flames came dangerously close to Wolf Creek, a popular ski destination near Pagosa Springs in southern Colorado, but when we arrived in the city in July, winds were blowing the fire away, and the sunny town was welcoming summer tourists. 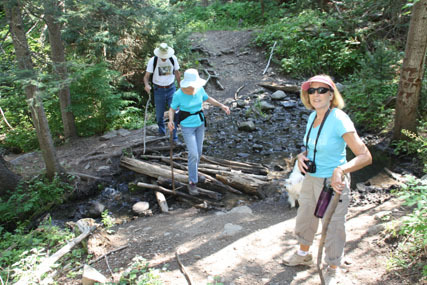 Hike to Opal Lake required crossing several streams. We were visiting friends in Pagosa Springs, a pretty little town located at an elevation of 7079 feet in the foothills of the beautiful San Juan Mountains. After walking around town and checking out the springs, we went on a 1.5 mile hike to Opal Lake. Although there was mild elevation gain at first, the hike was relatively easy. Our only challenge was crossing several streams by walking on rocks and logs and without slipping into the water. 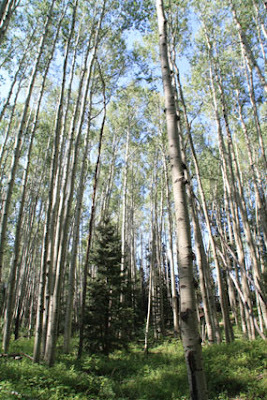 The trail was decorated with small pastel wildflowers and plenty of loblolly pines, ferns, cedars, and aspen groves. On reaching our destination we walked around the lake, admiring reflections in the slightly opaque pool. In addition to plentiful hiking trails, another main attraction of Pagosa Springs is the 1.5 mile stretch of the San Juan River (a significant tributary of the Colorado River) that flows through downtown. That allows easy access to swimming, kayaking, tubing, fishing, and lounging in hot springs. Although the river is filled with snow melt in April and May, by mid-summer temperatures are mild enough for water adventures from challenging whitewater rafting to gentle tubing. Guinness World Records named the Pagosa Aquifer the deepest in the world, and the hot springs invite guests to relax year round. Take a dip in these “healing waters” for the perfect conclusion to a day of river activities or hiking. Three downtown establishments offer different hot springs experiences with more than 30 indoor and outdoor facilities providing tubs, mineral baths, pools and saunas. 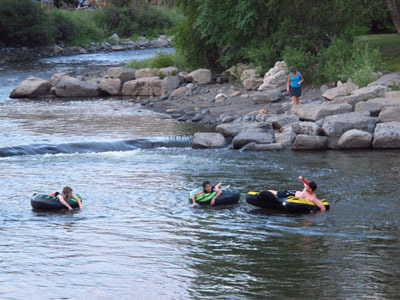 Tubing in the San Juan River is a popular pastime in Pagosa Springs. After our hike and al fresco lunch at The Brewery, we said good-bye to our friends and headed to Durango, happy to have had the opportunity for a brief stay in Pagosa Springs.